We offer capacitors to the client as per the requirements.We introduce to our clients a wide spectrum of Capacitors, which is used for smoothing the output power supply in electronic circuits. These capacitors are renowned in the market for their high efficiency, precision-engineering, durability and longer service life. Our range of capacitors is offered at most discounted prices. Clients can avail from us Fuses offer excellent protection solution for capacitor connected networks. An external fuse arrangement for capacitors & capacitor banks is necessary in order to ensure the system reliability and safety. The fuse selection shall be based on the following criteria like capacitor size, short circuit level, transient surge etc. 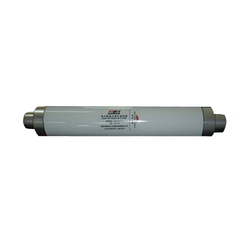 Fuses suitable for capacitors are available in rating from 3.3 kV to 18 kV. The Fuse are designed to the suite for installation in both Indoor & outdoor.